Mirror Mirror on the wall who is the fairest one of all? Apples have been used in all manner of ways. The most tasty is perhaps, the pie. Apple slices, spiced with cinnamon, and nutmeg, baked to perfection in a flaky crust. They represent knowledge. The apple as a symbol for learning has been around since biblical times. It is also the symbol for one of the most widely used companies in the history of the world: Apple. With their IPhones, IPads, and Mac computers. And, ever since 1937, we have associated the apple with evil queens trying to poison sweet young girls. That wicked queen was also our new way of looking at step mothers. Wicked. Cruel. Evil. Snow White wants nothing more than to please her step mother. But, with all step-mother/daughter stories there is no pleasing the step mother. The Evil Queen orders Snow White murdered. But, look at beautiful, sweet Snow White. We can understand why the Huntsman was unable to kill the lovely Snow White. 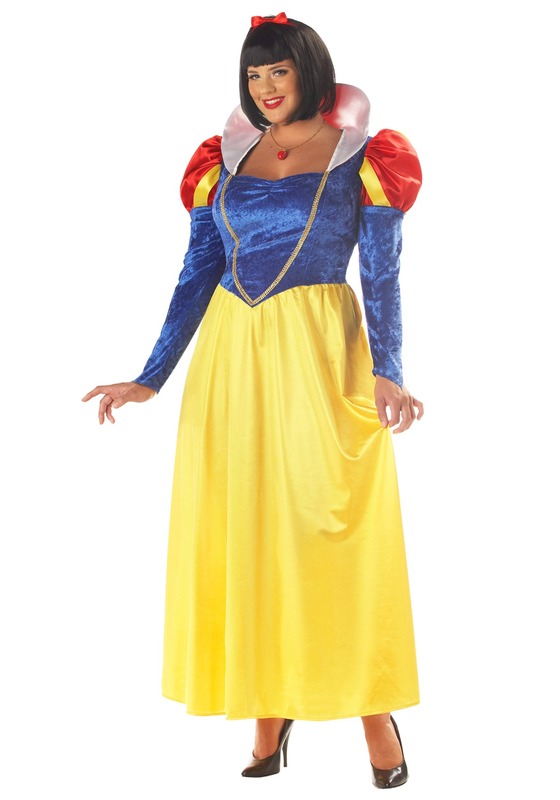 This Halloween you can have people fawning at your beauty in this Plus Size Women's Snow White Costume. The women will be jealous, and the men will be going out of their way to wait on your every whim. While wearing this costume however, you might want to stay away from apples. That means no apple pie, no Apple products, and if an old hag hands you some food maybe just give it someone else. In the cottage of the Seven Dwarfs, dwells Snow White, fairest of them all. It was everything it said it was. The fit was perfect! Never in my wildest dreams did I ever think if be a Disney princess much less Snow White...but it was perfect! I loved wearing this dress and felt just like Snow White. I ordered it in a size larger than I normally wear and it was perfect. The sleeves up top were very tight though. They had elastic in them that squeezed my arm so tight I couldn’t stand it. I cut out the elastic and then it was really perfect. The dress was made very well for the money. I am so glad I ordered this dress! This costume is great! The gown is so beautiful and matches Snow White perfectly! The only issue I had with the costume is the headband is only a ribbon and not a band so I had to order my own. I won the costume contest at my job for best Disney Costume! Thanks for a great costume! I felt beautiful in it! I ordered both snow white costumes, both in the same size.. this costume i could not get over my shoulders, so i thought i would go in feet first. i could not get it past my knees. the waste is extremely small there is not stretch or give and take at all in the waste... I really liked this one with the long sleeves OCT is cold here. The 2nd snow white short sleeve one, was to big, and the length about 2 inches laid on the floor. I am 5'9.